I made this pie with the sole goal of using it to upgrade the photography in my archerfriendly vegan pie crust recipe. The pie turned out incredibly well, beyond expectation. It deserved its own post. I still upgraded my pie crust post with better photography (since the original photos for that post were from 2012! 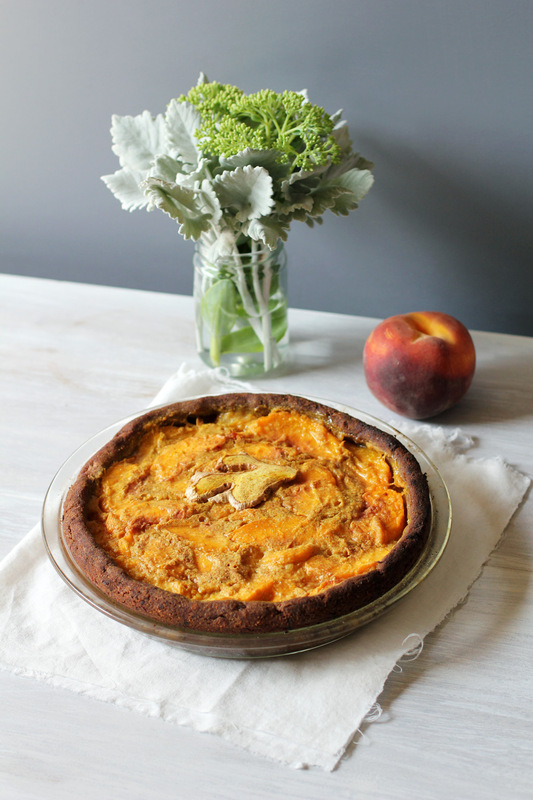 ), but I saved my Ginger & Turmeric Peach Pie photos to feature here on my blog. I have a rule that I can’t post any recipes on archerfriendly without having made them twice. When you’re working without normal person ingredients like flour, butter, sugar, and eggs, well, the food will be different. Then there’s my unsweetened mission: get away with using as little sweetener as possible. All of this makes for a unique product that you should probably make a few times before you share it with the public. This recipe breaks the rule! I made it once, it was absolutely delicious, and so here you have it. I want my recipes to work for you and I want you to like them. But in order for you to like them, you have to have a taste bud makeover — enjoy your desserts a lot less sweeter than you’re used to. 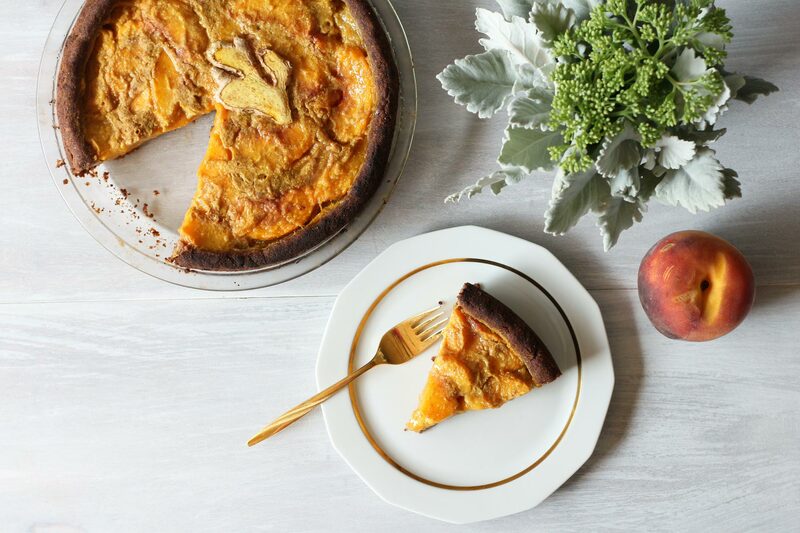 My Ginger & Turmeric Peach Pie is sweetened with twenty drops of liquid stevia in the filling and six dates in the crust. That is it! Peaches are a sweeter fruit, sweeter than blueberries. Sweeter means it contains more fruit sugar that can potentially bother your blood sugar. 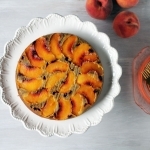 Put that peach in the oven and it will get even sweeter! 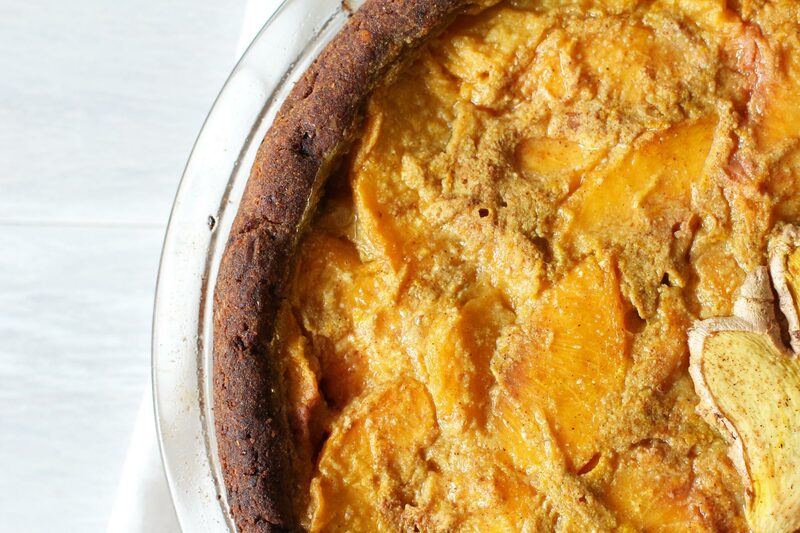 A baked peach is harder on your blood sugar than a raw peach. Are you following what all this means? It means that baked peaches die a little inside when you don’t trust their natural sweetness. 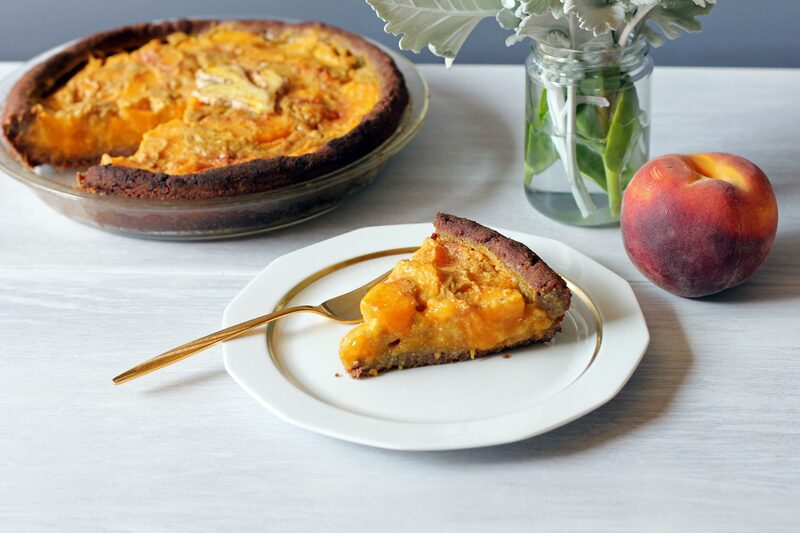 You really do not need much sweetener, if any, when you bake with peaches. I put twenty drops of stevia in my recipe because the turmeric needed a little rounding out with a sweetener. Turmeric can be a little strong. Sweet paired with turmeric can take the bitter-ish earthy edge off it. Fresh ginger and fresh turmeric is a must, although if you live in a rural area, finding fresh turmeric can be difficult. If you can’t find it, your pie will still be delicious. You can sprinkle in some dry turmeric but I’m not sure of the conversion. The most important thing is not to overdo the turmeric, especially if you’re not used to the taste. In the recipe, I say to grate about a marble sized piece of fresh turmeric. You can grate a smaller amount than that if you’ve never had it before, just to be safe. I like sticking turmeric in as many recipes as possible due to all of its health benefits. It’s a strong anti-inflammatory agent. Give me all the turmeric! The filling features freshly ground buckwheat flour, a gluten free and sugar free way to help your pie hold together! I make my own buckwheat flour by grinding raw, hulled buckwheat in my Vitamix dry container. The filling would work wonderfully baked as-is, without any pie crust in case you don’t feel like cleaning your food processor to make the pie crust (that’s my #1 deterrent). I absolutely love peaches paired with buckwheat. They are the perfect match. 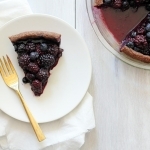 Prepare archerfriendly vegan pie crust and have it ready to go. Sprinkle the bottom of the pie crust with 1/2 teaspoon buckwheat flour. Remove peach skins by dropping them, one by one, in boiling water for about 15 seconds (or until skin splits). Immediately remove from the boiling water. Peach skin should rub off easily. Slice peaches and place in mixing bowl. Add lemon juice, vanilla, and stevia to the sliced peaches in the mixing bowl. Using the 1 inch piece of fresh ginger, finely grate about a marble sized amount of ginger into the mixing bowl. Using the 1 inch piece of fresh turmeric, finely grate about a marble sized amount of turmeric into the mixing bowl. Carefully mix ingredients, being careful not to mush the peaches. Add 1/4 cup buckwheat flour, mixing tenderly to evenly spread the buckwheat. Pour mixture in pie crust. Cover with aluminum foil. Bake covered at 425° for 30 minutes. Remove aluminum foil and bake uncovered for another 15 to 20 minutes. 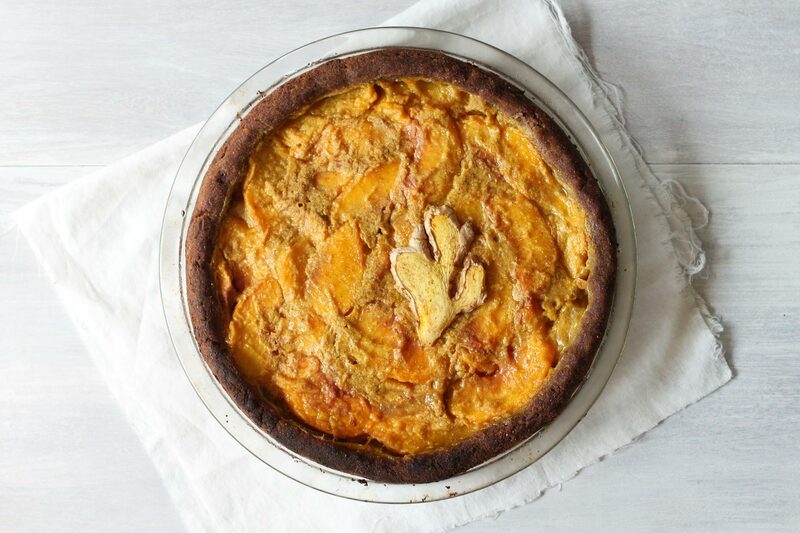 Once pie has cooled completely (or overnight), store in the refrigerator. Serve cold.